"Doing art is a basic human right. It's my way of life, a force and purpose for being here," says Vitek Kruta. One of the hundreds of professionals showing and selling art at this spring's Paradise City, Kruta is also one of the many talented individuals who does not need a "day job." In Prague, Germany, and now in Holyoke, Kruta has perfected his various art genres for the past 35 years. A bedroom wall was his first canvas as he sculpted a purposely lopsided molded frame with painting inside. People went to the wall to straighten the picture, and the joke was on them. 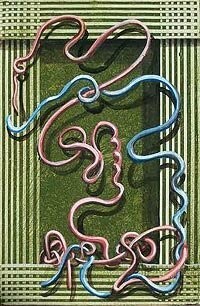 This Trompe L'oeil 3D art form can be translated "fooling the eye, illusion." This continues to be one of Kruta's styles which have been successful and popular - enough to have made him a "regular" at Paradise City for eight years. This juried show accepts only the best of fine and functional art from throughout the country. Visionary Landscapes are Kruta's mainstay. From his mind and memory, he almost feels, smells, and hears a scene. "I try to open an esoteric door and invite the viewer to go to these places," he says. His Surrealist Paintings "illustrate reality that is not real." Kruta's explanation of his technique is exploration of the subconscious. Shapes are familiar and resemble what is known - not the tangible, but the essence. "I like to work with materials - wood, clay, mosaics, metal. The enjoyment is in the process of making things. I get an idea and I do it," he says. His home is his workplace with an attic and basement full of materials of all forms, shapes, and sizes. Exposed to art since he was a youngster, Kruta's own children have followed this career path. Three family members restored the paintings in Northampton's First Churches. In fact, art restoration is a large section on Kruta's resume. One genre which will not be seen at Paradise City is his murals. Needless to say, they are too large, not to mention affixed to walls in hospitals, buildings, and homes. Yet, easy to carry and perhaps place in one's garden are exotic 3' metal flowers. He cuts, bends, and shapes the stems and petals out of sheet metal "to simultaneously become real, yet not real," not unlike his other art. He made the clear decision as a youngster that he would never separate himself from art. "Whatever I do must be connected to art," continues Kruta. That was his commitment to himself many years ago, and still holds today.